Posted: Thursday, June 12, 2014 3:00 pm | Updated: 10:47 pm, Thu Jun 12, 2014. Elana Meyers, left, at the 2014 Winter Olympics. 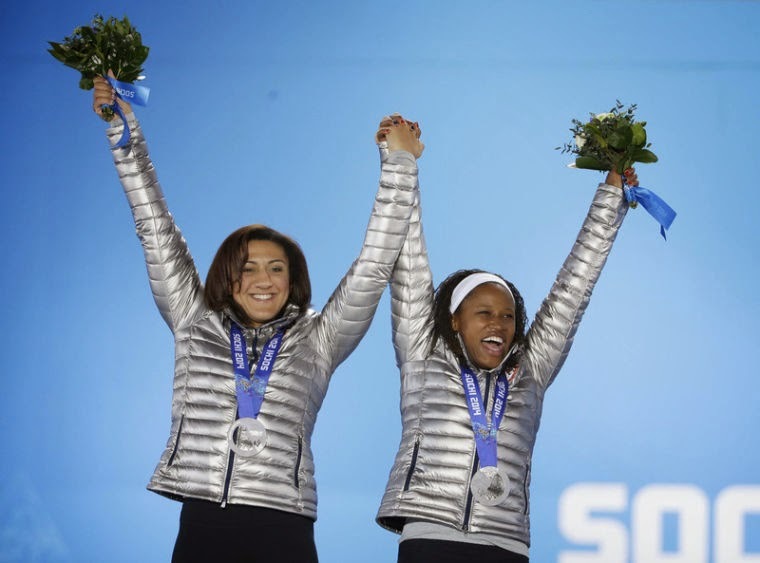 When Lauryn Williams won a bobsled silver medal with Elana Meyers Feb. 19 in the Winter Olympic Games, she became just the fifth athlete ever to have won a medal in both the Summer and Winter Olympics — and the first American woman to do so. Williams was a three-time Olympian in track and field and won the silver medal in the 100-meter dash at the 2004 Olympics and was part of the 2012 Olympics gold medal 4x100 relay team. However, she had no idea just how special her Winter Olympics accomplishment made her even after she just missed winning a gold medal. She knew teammate Lolo Jones, a track and field Olympian, had also made the bobsled team, a rare feat in itself. “But I didn't know what they meant about making history, so I really didn't answer or follow up the question. I didn't know what I had done until we had won the medal and they said I was the fifth to do it and first American woman. I just said, 'Really, that's cool.' It doesn't sink in and stick with me that I have accomplished that,” she said. After she helped position the 4x100 relay team in qualifying to win the 2012 gold medal, she had no intentions of joining the bobsled team. She joked that her reference for the bobsled was the movie “Cool Runnings” about the Jamaica bobsled team. That changed after Jones convinced her to try out for the team and told her that her “speed and power would probably make her perfect” for bobsled competition. Still, she went to Sochi (Russia) expecting to win not just a medal, but the gold medal. Still, that has not kept her from replaying her team’s final run — the slowest of their four trips — that dropped them from first to second in Sochi. She says it is impossible to rank exactly where winning the silver medal ranks among her athletic accomplishments. Now she’s trying to share “little things” with the Centre campers to make them better. “You can give them one little piece they can take and apply to their summer track or their coach can use with high school track. It is important to find one thing you can ingrain in them as opposed to throwing 75 different things at them and they leave and can’t remember it at all,” she said. But she is also enjoying being with other Olympians, including current world record holders Kevin Young and Aries Merritt, and learning from them.